Are you a morning person? Our experiences differ greatly. Some of us love greeting the new day. We receive it with joy and are filled with a sense of eager expectation. We cannot wait to get going with the tasks and responsibilities that await us. Some take a bit longer to get going. Others wake up with a sense of heaviness and fatigue. We wonder how we are going to make it through the day, especially on those gray mornings when it is difficult to get out of bed. Let me ask you: How did you feel first thing this morning? As this special Easter morning dawns, the disciples are deeply despondent. They have been out fishing all night but have caught nothing. All their efforts have been fruitless. Then as the darkness of the night gives way to the rising of the sun, they catch a glimpse of a figure standing on the shore, waiting for them. 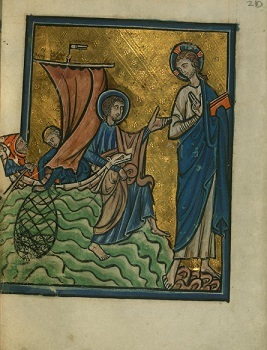 At first they do not realize that it is Jesus, but when he calls out and gives them fresh instructions about where to throw their nets, resulting in an amazing catch, they recognize him. There is an Easter promise for all of us in this gospel encounter. The risen Christ waits to personally meet us every new morning. Whether we wake up with feelings of joyful anticipation or with a sense of desolation and sadness, Jesus greets us by name and offers us direction for our day. Through the gift of his Spirit offered to each of us, he then wants to accompany us through whatever challenge and difficulty the day may hold for us. Indeed, as this story reminds us, we can be assured of his living presence reaching out to us, especially in those tasks where we have labored and seemingly have gotten nowhere. Easter people start each morning knowing this assurance. We receive the day as a gift. We give thanks for it. We acknowledge the risen One who greets us. We listen for his voice. And then we seek to do whatever it is that he tells us to do. Think about how you can develop a simple ritual around that moment when you open the curtains each morning. Perhaps as you draw them apart, you can simply say, “Thank you,” or, “Lord, I greet you,” “Jesus, have mercy,” or another short phrase that expresses your resurrection hope for the day.